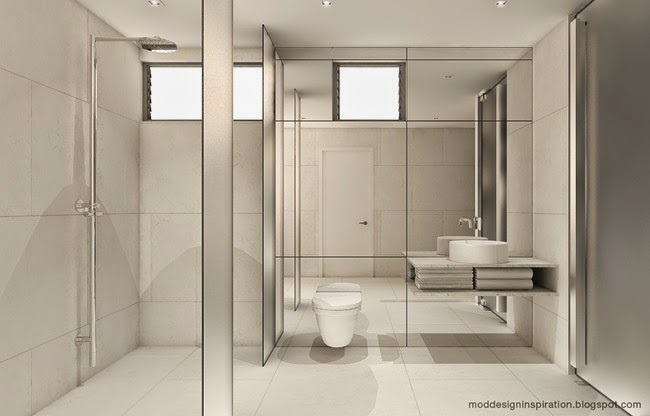 Crisp and clean bathroom design is ideal for many of today’s more modern homes. However, what works best in one home is bound to be wrong for another. For this reason, the very first step in designing the look that’s right for your home is to design it around the features already in place. Clean design begins by working with your architecture. If your bathroom already has unique and interesting architectural features, adding unusual fixtures can produce an unnecessarily complex look. However, if your bathroom design is extremely simple, unique fixtures and features can, when placed sparingly, produce just the right amount of flair. What’s right for your space is entirely dependent on what natural features you’re working with. Color used sparingly can produce a clean look while still providing a bit of elegance. For example, a red tiled shower enclosure can pop in an otherwise Spartan area. Though you needn’t go so bright to create a dash of excitement. A single, brightly colored shelf or even an exotic plant can stimulate without agitating. Clean, minimalist design doesn’t mean boring. In fact, even simple design can be unexpected and fresh. Choosing uniquely shaped sinks and cabinetry, updating faucets, selecting interesting bathtub designs, even adding towels or paintings with peculiar motifs can provide a bit of “wow” while still working within a clean and streamlined aesthetic. Is There a Best Time to Remodel Your Bathroom?